In the northeastern corner of the Blue Ridge Wine Region and just west of Smith Mountain Lake, there’s a small family-run fruit winery. H.T. and Rhonda Page have been making a range of fruit wines since 1996. The first twelve years were spent perfecting their wines as they produced strictly for personal consumption. 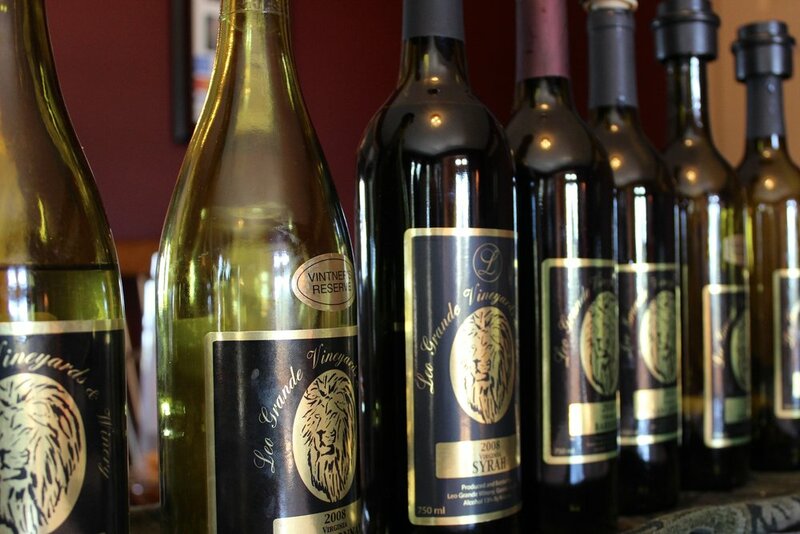 In 2008, the Pages received their farm winery license, stepped up production and started making wine commercially. The operation is small. It really is just the family that runs the business, so there may not be anyone in the tasting room when you arrive, but someone is always on call. There is a bell at the top of a tall, wooden pole just outside the tasting room. A sign is attached prominently at eye level instructs visitors to “Please ring bell for service.” A member of the family will come out and conduct the tasting. The Pages grow blackberries on their property. Most of the other fruit is purchased locally, with the exception of the peaches, which come from Nelson County in Central Virginia. When I mentioned earlier, that this is a small operation, I did mean small. Only 200 cases are produced annually, but I found them to be of good quality. They are primarily dry, light-bodied, balanced wines. There were nine offerings on the menu when I visited. These included pear, three different blackberry wines of differing levels of sweetness, blueberry, plum and peach. Brooks Mill also offers a Sangria made from the blackberry wine. It appeared that blackberry was the real speciality, but I also thought the dry-style pear and plum were exceptional fruit wines. There is something on the list that will appeal to most palates. 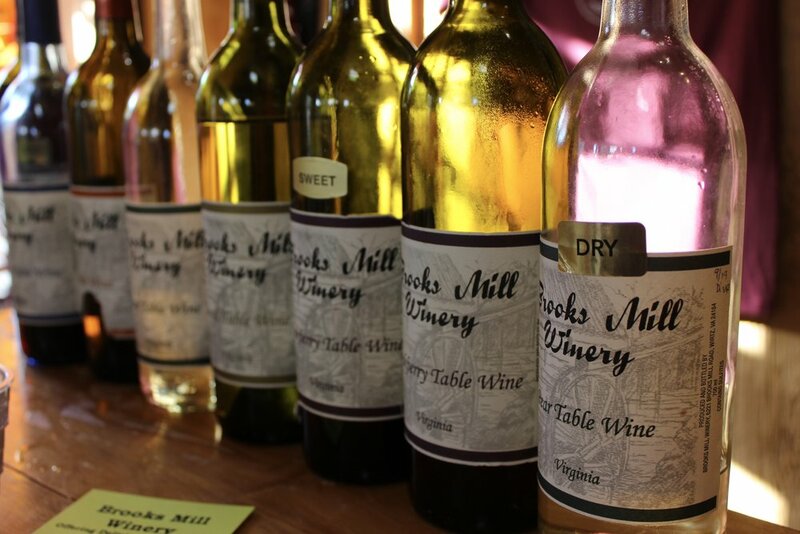 Brooks Mill attends between eight and ten festivals each year and there is some local retail, but most of the wine is sold through direct sales out of the tasting room. So if you’re going to try these wines, you’ll need to visit. When you arrive, remember to ring the bell. I believe that you’ll enjoy your tasting, but by all means let me know what you think. Down in the southern end of the Shenandoah, just north of Roanoake, you’ll be approaching the higher elevations of Virginia’s Blue Ridge Mountains. This area is not known for the concentration of wineries that exist elsewhere in the state, but the few dozen or so in this area tend to produce very good wines. Fincastle Vineyard is one of these. The area around Fincastle was once rich in beef cattle, but a Mad Cow Disease scare destroyed many of the overseas markets, which sent local farmers scrambling for another source of income. So in 1995, Richard and Kaitlin Classey planted their first test strip to explore the viability of wine growing. Things obviously worked out. Today they are producing between 1400 and 1500 cases of wine each year from five acres of fruit. Richard learned beer and winemaking from his mother, so he’s really been doing this in some capacity his entire life. He went on to study chemistry, which is more common as a trajectory to winemaking than it might appear. A discussion with Richard will quickly reveal his passion for the art and science of making wine. He can go on at length about the technical aspects of viticulture, soil composition and and the wine-making process. He loves to share what he knows and his passion is reflected in the quality and composition of each of the Fincastle offerings. Fincastle produces a mix of dry and off-dry wines. I tasted eight during my visit and, while my palate tends toward drier wines, I was able to appreciate each on its own merit. The Viognier was perfectly balanced and was full of lovely peach and apricot notes. The Chardonnay was another winner and displayed all of the typical characteristics of that varietal. My top pick was the Knight’s Tour, which is Fincastle’s Bordeaux blend. Twenty four months in oak lent some real complexity to the red fruit on the nose and palate and a beautiful finish. 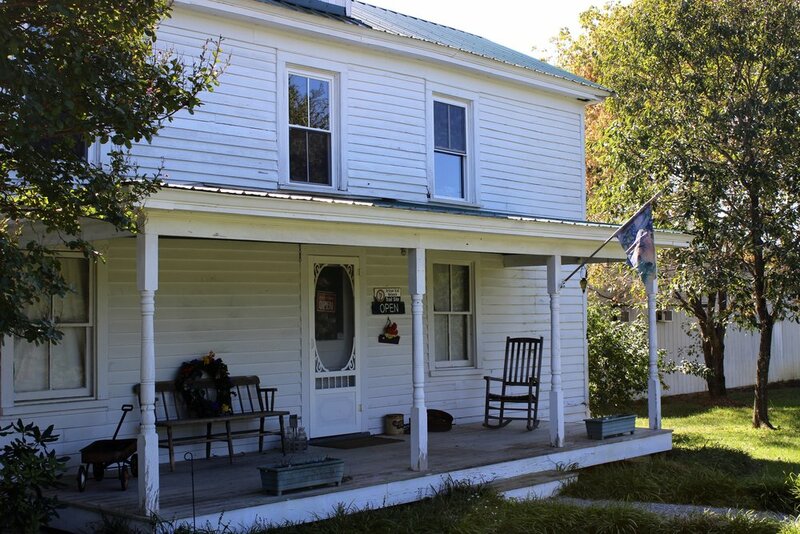 The Classey’s also operate a Bed and Breakfast on their lovely property. It really is an idyllic setting. The patio outside the tasting room or the porch in front of the house offer a view of the woodland and rolling hills that surround the estate. It’s definitely a spot that will inspire you to linger. The location may seem remote, but it’s only about ten minutes from Interstate 81 and very easy to access. If you’re passing through, Fincastle offers an excellent opportunity to find out what Virginia wine is all about. I heartily recommend a short detour. Roger Furrows was introduced to wine in the early 1960’s while serving in the Air Force. So he was discovering fine wines, while California was still producing jug wines. There’s irony there somewhere. Anyway, that passion for wine stayed with him for the rest of his life. Upon returning to Virginia and while spending time at his family’s home near Smith Mountain Lake, he began to explore Virginia wineries. Around this time, he also planted an experimental vineyard on the lakeside property and began making wine for home use. This was just the beginning. In the late 1980s, Roger and his wife Judy started looking for property appropriate for viticulture and settled on the site that became Hickory Hill Vineyards. They began planting in 1992 and spent a few years just selling the fruit. They also restored the circa 1923 farmhouse that currently functions as the tasting room. Then in 2000, the first Hickory Hill vintage was bottled. Today, from the five acres under vine, between 1500 and 1800 cases of wine are produced each year. This also made Hickory Hill Smith Mountain Lake’s oldest winery. 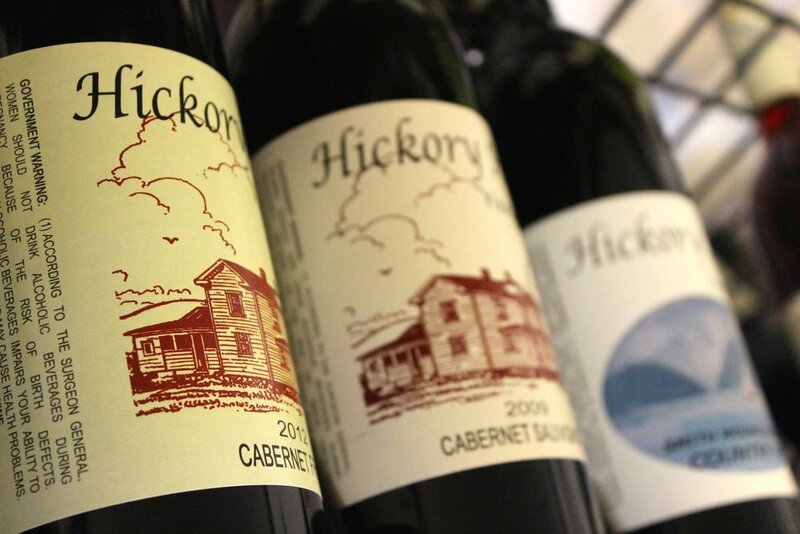 Today, Hickory Hill is a family-run operation that produces primarily soft, but complex, old-world style wines with light tannins and low alcohol levels, made exclusively from French vinifera. Roger explained that, “they are making wines that they want to drink.” The Furrows are fortunate that their location is near the fairly affluent lake community, where there is an appreciation for this type of wine. I tasted nine of the wines and was fairly blown away by the overall quality. There was an oaked and an unoakded Chardonnay. Both were balanced and extremely well crafted, but the Smith Mountain Lake Mist was one to write home about. This Vidal-Chardonnay blend was filled with pear and honeysuckle notes, followed by a crisp citrus finish. Among the reds, I tasted a couple of very nice blends, but the single varietals were the main event for me. I love a good Cabernet Franc and the Hickory Hill offering did not disappoint. I have to say though, the Cabernet Sauvignon was my top pick overall. There was emphasis on the fruit and that’s what I got on both the nose and palate in this very complex wine. The finish was long with very soft tannins. It is an absolutely remarkable wine. I mentioned earlier, that the winery is fortunate to have an affluent, wine-drinking community nearby. It's fair to say that the community is equally fortunate. While I was in the tasting room, a mother and daughter came in for their very first wine tasting. Roger took time to explain every aspect of the tasting process and provided background on each of the wines. He went on to discuss the wine style and winemaking and made every effort to educate the visitors. This couple got lucky. What a great winery to select for a first tasting and how fortunate they were that Roger was behind the bar. Hickory Hill is, and will likely remain, a family-run winery. Roger is still active in many capacities, but around 2010 his daughter and her husband began to take more control over day-to-day operations. One doesn’t often see this kind of generational change in a Virginia winery and it’s nice to know that the winery will continue to operate well into the future. So there is still an opportunity to visit, but don’t put it off too long. This winery is something of an institution in the region around the lake for very good reason. Stop in and let me know what you think. From many parts of Bedford County, there is an unobstructed view of the Blue Ridge and the Peaks of Otter stand out prominently among the other mountains. From the lawn outside LeoGrande Vineyards and Winery, this is the backdrop that is part of an unhindered view out across the vineyards. The Big Otter River borders the property on one side. It really is a breathtaking location that seems quite rural despite it’s relative proximity to Lynchburg. Norm LeoGrande hales from Long Island, but purchased his 400 acre parcel of land and planted his first vines back in 1994 at a time when Virginia wine was still in its infancy. At that time, it was the only winery in the county, but since then others have grown up around it. 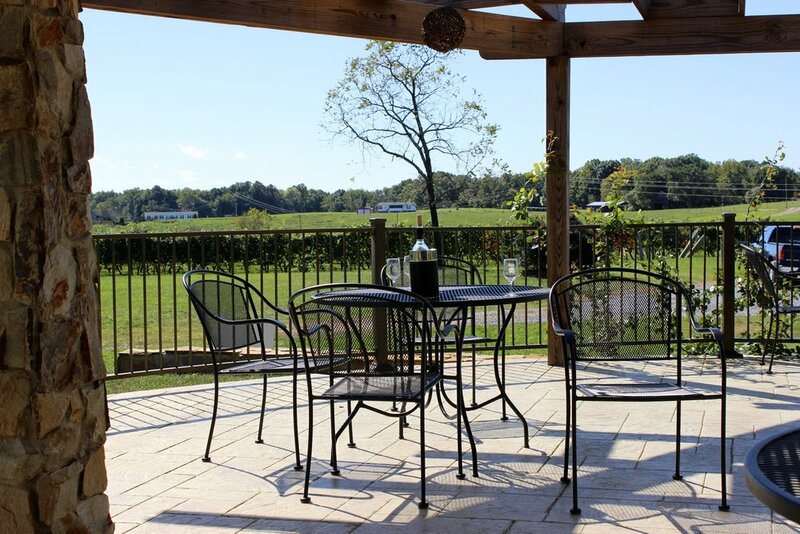 Norm’s winery is in the Central Virginia wine region, but it is far removed from the large cluster of wineries that make up the Monticello AVA. The terroir differs greatly from that of its far-northern neighbors and Norm has capitalized on that to create some fairly unique offerings. LeoGrande is currently producing about 1500 cases of wine each year. In the vineyard, you will find most of the international varietals that are grown throughout the state. You will also find grapes like Barbera, Sangiovese and Nebbiolo. This is one of only three or four wineries in the Commonwealth that specializes in Italian varietals. I will go a step further and point out that they are not just being grown. Norm is deftly crafting these grapes into exceptional wine that feature significant time in oak. We started off the tasting with a Chardonnay that saw thirty-six months in oak. That’s almost unheard of, but it worked. The vanilla notes didn’t overpower the fruit and the mouthfeel was just over the top. It really was a wonderful wine, but I think the reds are the main story here. There is a Syrah that also saw 36 months in oak. It had smoke and leather along with some floral qualities on the nose. In the mouth it was complex with dark fruit and a bit of spice. The Reserve Sangiovese was outstanding with it’s big berry aromas. There was just a lot going on in this wine. The Nebbiolo was the real standout for me. It had a nose you could get lost in. It was another complex offering with spiced cherry and floral qualities and it was the main event in a lineup of stars. LeoGrande sits at the midpoint between Lynchburg and Bedford. Roanoke is not too far away. So the tasting room does a brisk business. The quality of the wine and the stunning panorama that is offered as you look to the west are certainly big draws. The tasting experience is also first rate and a regular Saturday music event just sweetens the pot. So if you live nearby or find yourself in the area, this is a stop worth going a little out of the way for. After you’ve paid a visit, let me know what you think. Just a short drive from the Blue Ridge Parkway and situated at the very based of the mountain slope, you will find Peaks of Otter Winery and Orchards. While it is listed as a stop on the Bedford Wine Trail, it is much more than a winery. It’s an experience and it’s one that can appeal to small groups or entire families. Wine tasting is only one among many possibilities. I have only visited once and that was in early autumn. The leaves had not yet started to change colors, but apples were in season. There were buses and cars in the lot and many visitors were there just to pick fruit. I can imagine that during peak foliage season, there will be larger crowds stopping and the amount of parking leads me to believe that this is a venue that prepares for large crowds. Peaks of Otter is a part of Johnson’s Orchard (or maybe it’s the other way around) and tours of the farm leave at regular intervals, but fruit picking is also available right there on the premises. There are also a number of different farm out buildings and things to see on the property, so plan to spend some time. You’ll also find plenty of space for a picnic, so pack a lunch and enjoy the amazing mountain views. As you step inside the tasting room, you’ll find an assortment of jams, jellies, maple syrups and other sundry items. One can definitely channel one’s inner shopper. Even if you’re not in the mood to buy, you can spend a fair amount of time browsing. When, or if, you’re ready, you’ll find the tasting bar in a back corner and you’ll likely have to stand in line to sample the wines. Once you’ve made it to the bar and you’ve collected your tasting sheet, you’ll notice that there are something like thirty fruit wines and just a single grape wine made from White Concord, Niagra and Vidal Blanc. There are so many different choices, that it’s almost overwhelming. The list ranges from very conventional fruit wines to offerings like “Kiss of the Devil,” which is made from a variety of peppers. Tasters are awarded a special sticker for tasting that particular wine. So I’m sure you’ll find something on the menu that appeals to your palate or perhaps you’ll take a more unorthodox route. In any case, the entire tasting is something of a spectacle and visitors all seem to love it. My first impression was that Peaks of Otter seemed a little over the top, but my opinion softened as I observed a bit longer. Everyone around me was thoroughly enjoying the experience. All of those visitors can’t be wrong. So I have to say that no tour of Virginia wine country can be complete without stopping by. Furthermore, the range of activities makes it appropriate for children. Check them out and let me know what you think. We were spending the weekend down at Smith Mountain Lake, in Bedford County. While there, of course, I wanted to visit a few of the local wineries. So we drove over to Ramulose Ridge Vineyards, the counties newest winery, located just a few minutes south of Moneta, Virginia. The winery and tasting room occupy the high ground that faces north overlooking the surrounding farmland. 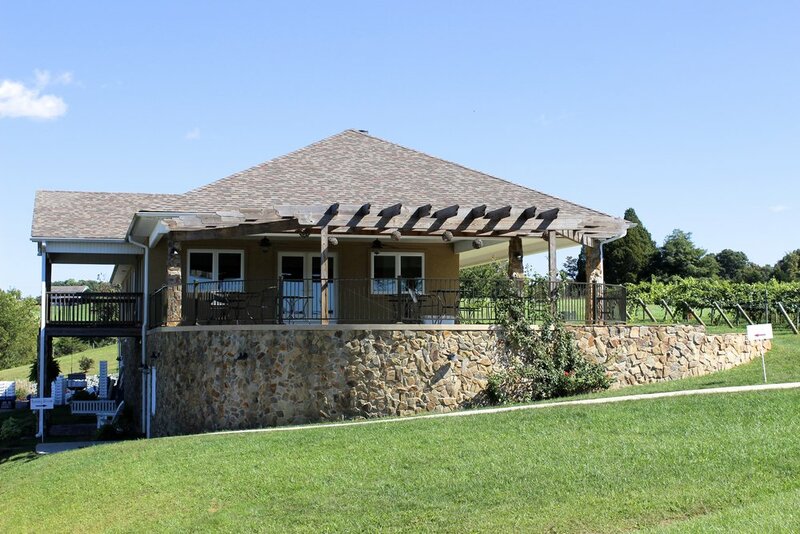 The patio that extends prominently from the side of the building offers an even better view of this panorama and looks out at the vineyards on the west side of the property. Ramulose Ridge is in every sense a family winery. Jim and Sandi Ramaker decided to start a winery on their property near the lake and enlisted the help of their son Mitchell and his wife Michelle. Together they manage all the functions of the winery. The Ramakers began planting grapes in 2004 and today they have a total of five acres under vine. By the time the winery opened in 2013, the vines already had a little age. From this acreage, between 2000 and 3000 cases of wine are produced each year. They do not import or purchase local fruit. All of the small-batch boutique offerings are made exclusively from estate grapes. I tasted thirteen of the Ramulose Ridge wines. They range in style from dry to sweet, but I found them all to be well crafted. Even the sweet wines displayed real balance between sugar and acidity. Among the dry whites, the Viognier was the real standout. It had nice honeysuckle and stone fruit notes with crisp acidity. Among the reds, I loved the Syrah with its soft fruit, spice and long finish; but the Cabernet Franc was my top pick. It’s on the light side, but has a distinct chocolate nose and great raspberry notes. I’m a sucker for a good Cab Franc and this one did not disappoint. BJ was working the tasting bar and I thought she represented the winery and the industry very well. Her enthusiasm and wine knowledge showed through and made the experience worth going back for. It really is a winery worthy of our support. Stop in and let me know what you think. The drive south on Interstate 81 is always filled with truck traffic. We got caught in a snarled mess of cars and trucks, which caused us to miss the exit for the winery we'd intended to visit. Rather than turn around, we decided to press on and select an alternate destination. This was just dumb luck. We climbed out of the Roanoke Valley and wound our way up Mount Chestnut Road. Valhalla Vineyards sits at 2000 feet and provides a commanding view of the valley and the distant Peaks of Otter. I know I'm always remarking on some incredible view, but Valhalla offers something truly amazing. I can't say it's the best view from any winery in the state, but it tops any I've seen so far. It was breathtaking on an overcast day. So there you have it. There is more to Valhalla than just the view. The "Cellar Door" tasting room (pictured above) was constructed in 2003. The interior is spacious, but the large, covered back porch seems like the perfect place to relax with a picnic and a glass of wine. It was cool enough on this early fall day to enjoy our first fire of the season in the outdoor stone fireplace. Valhalla also boasts a man-made barrel cave constructed 60 feet underground. Tours of the cave are offered on the third Saturday of every month. Finally, on Friday nights through October there are winery-sponsored music or dancing events. Valhalla produces all of their wines from the 21 acres of grapes on the estate. Only three of these acres are devoted to white varietals. The remainder are used to craft big, bold reds. The first vintage was released in 1998, so the vines have about eighteen years, which is displayed in the quality of the wine. The winery specializes in wines that can be cellared and Valhalla has an extensive wine library. Aside from the two white varietals, no vintage on the tasting menu was more recent than 2008 and the reserve list sports a 2001 Cabernet Sauvigon and a 2001 Bordeaux blend. I have not encountered this at another Virginia winery. The desire to produce only wines that will age led to a decision to discard the entire 2013 harvest. The quality of the grapes does not meet the Valhalla standard, so there will be no 2013 vintage. On one final note of jaw-dropping amazement, the most expensive selection on the wine list is a mere thirty dollars. Ah the wines… I tasted the eight wines on the reserve list for only ten dollars. I could do a rundown of everything I tasted. Every selection was amazing. But I'll stick to my two top picks. The 2001 Cabernet spent 40 months in French oak. It has the most beautiful bouquet of red fruit. In the mouth, there was cherry with hints of leather, nice round tannins and a finish that just went on and on. This Cab is a very complex wine that is drinking like a dream, but can go even longer on the shelf. I took some home. Oh, but the 2006 "Valkyrie" was even better and it's hard to believe that anything could be better than that Cab. The "Valkyrie" is a Bordeaux blend of all five noble grapes (Cab Sav, Cab Franc, Merlot, Malbec and Petit Verdot). On the nose I got chocolate-covered cherry and on the palate there was more cherry with some leather notes and a bit of tannin, but this one has some legs. I'd say it could go several more years in the cellar. This is one to collect. I think you've just got to see this winery for yourself. Even if you don't drink wine, which would be a shame, you should drive up there for the view. If you do drink wine, you're in luck. Valhalla offers a tasting experience that you'll be hard pressed to find at any other Virginia winey. If you're into big, bold reds, this is the venue you've been looking for. I'm already plotting my return on a third Saturday, when the weather is just a bit nicer, so I can do the cellar tour. I need to grow more thumbs, but for now I can give two thumbs up. 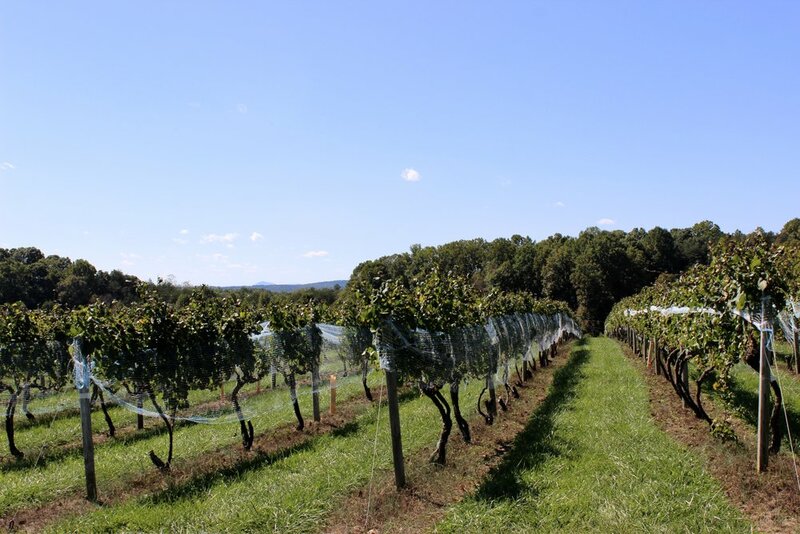 Down in the southern Shenandoah Valley, not far from Roanoke, there are a couple wineries that have been producing since well before Virginia was recognized for quality wine. One of these is Virginia Mountain Vineyards, which had been lauded by a number of bloggers prior to my visit. It seemed that I was a little behind the power curve (so to speak), so decided to make the drive and see what they are all about. The location is, in a word, stunning. Virginia Mountain rests on a hillside midway between the Blue Ridge and Allegheny Mountains. They were preparing for a wedding reception when I arrived and I can think of few spots better suited for such an occasion. Looking out across the vineyard at the distant mountains, it is a location that as destined for such events. David and Marie Gibbs got started in 1998 with the planting of their first vines. It was not until 2006, that the winery opened its doors. Today there are ten acres under vine and they are producing a modest 800 to 900 cases annually. David is the winemaker and I must say that his estate wines are excellent quality and a great value with the most expensive, the premier Trinity blend, priced at only $22. David learned winemaking as a chemistry student by making balloon wine. I had never heard of this, but it is made in a bottle with a combination of grape juice and yeast. The top is covered with a balloon, which the fermentation process then inflates. David assured me that it makes a perfectly awful wine, but for someone under the legal drinking age, it was a method of procuring alcohol. In any case, tasting the Virginia Mountain wines today, you would never guess that his winemaking skills originated from such a humble beginning. I was fortunate enough to taste several of the Virginia Mountain wines. I started with a pair of well-made Chardonnays. The lightly-oaked reserve took Bronze in this year’s Governor’s Cup. I tried the Trinity blend, which I think is a steal at price mentioned above. I must say, however, that the 2007 Cabernet Franc totally stole the show. I was excited to see a wine from such an excellent year on the tasting menu, so I sort of fixated on it. It was full of ripe berries with the characteristic pepper notes in the finish. It is a truly great wine and emblematic of what is possible at this winery. It was a bit of a drive from Charlottesville, but easily accessible for anyone driving south on Interstate 81. Virginia Mountain is one of those great Shenandoah wineries that simply doesn’t get the recognition they deserve. I am a huge fan what they are doing and I strongly recommend making the effort to visit. This is one that should be on your short list. So after you stop in, I will be very curious to find out what you think. 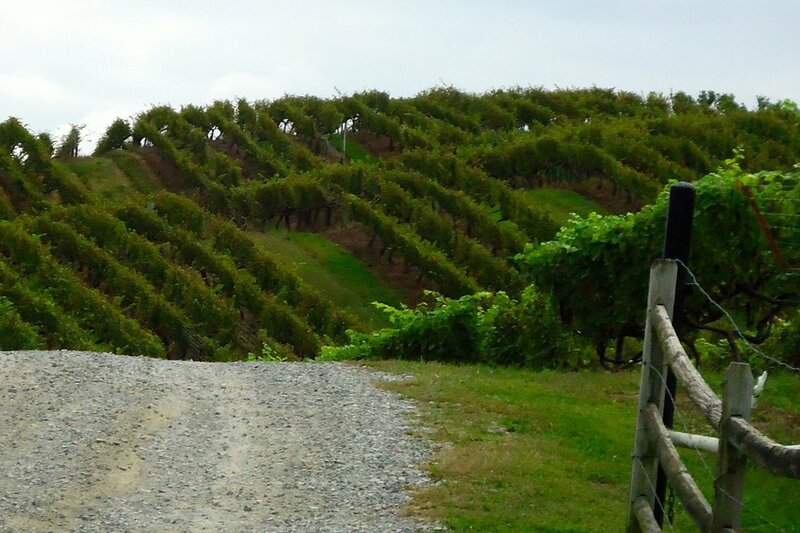 In the southwestern corner of the Central Virginia wine region, midway between Smith Mountain Lake and the Blue Ridge Parkway, you’ll find one of Bedford County’s premier wineries. It’s hear among the hills, in this rural location, that you’ll find White Rock Vineyards and Winery. It’s a tranquil and lovely location that lives up to the winery’s motto, “Escape to the quite beauty of White Rock." Fred and Drema Sylvester purchased the property in in 1989 with an eye toward eventually making wine. After the last of the children left home, they seized the opportunity. Between 2000 and 2003, they planting grapes. Over six acres of vines were planted and White Rock produced its first vintage in 2004. Today those grapes are used to produce between 800 and 1000 cases of handcrafted, estate-wine each year. In 2005, the Sylvesters opened a tasting room in one wing of their home. It is a lovely space with a cozy tasting area and a large adjacent sunroom that contains tables and seating for guests to relax with a glass of White Rock wine. 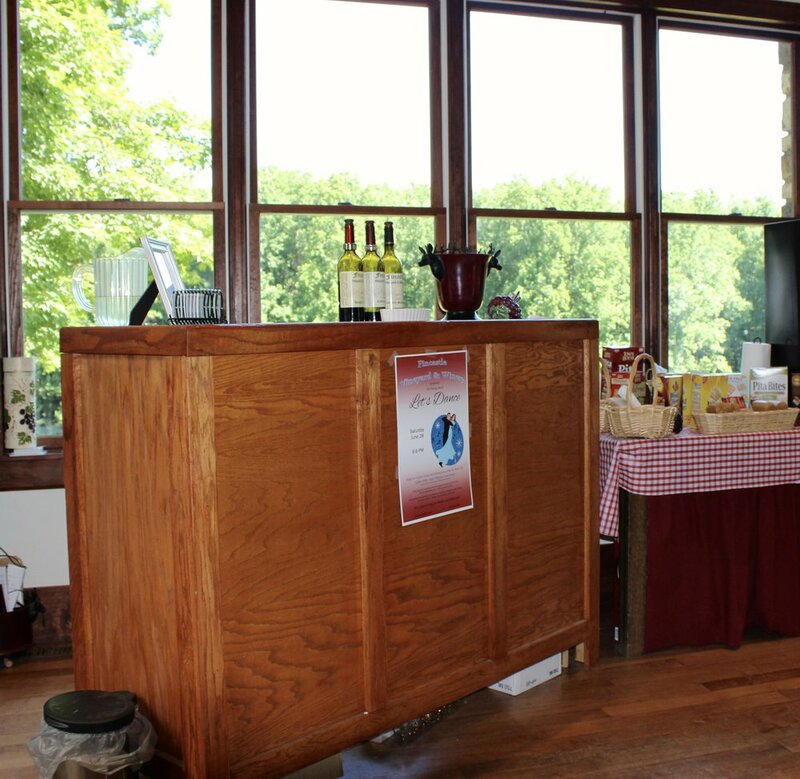 The sunroom looks out over the vineyard and provides a view of the distant mountains. It’s a panorama that one might spend hours admiring. There are a total of eight wines being produced at White Rock. All are well made, but I’d like to mention some that are of particular note. Moonglow is a Pinot Gris that has been fermented on the skins. It is, in effect, an orange wine. It has that signature copper color along with a big mouth feel and more complexity than you will find in a white wine. There are also a pair of red wines that deserve mention. The Cabernet Franc went through extended maceration (contact with the grape skins), making it dark and earthy, with big cherry notes. The Merlot, however, was my favorite, with it’s big fruit notes on the nose and palate. It’s a complex wine that contains a bit of pepper in a very long finish. It’s a potential award winner. Drema was in the tasting room when I arrived and she guided me through each of the wines. I also watched as she worked with other visitors and I have to say that her approach is educational and informed. It was a very well structured tasting and she was able to speak with real confidence about each offering and provide background and context for each wine. I can confidently give two thumbs up and heartily recommend a visit. So if you happen to be in the area, this winery is easy to access and completely worth a short detour. If you happen to stop in, please let me know what you think.